batman faces the ultimate threat against the city he is sworn to protect. The Scarecrow returns to unite an impressive roster of super villains, including Penguin, Two-Face and Harley Quinn, to destroy The Dark Knight forever. The game introduces Rocksteady's uniquely designed version of the Batmobile driveable for the first time in the franchise. 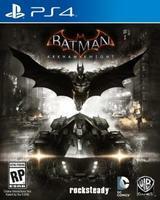 Batman: Arkham Knight offers gamers the ultimate and complete Batman experience as they tear through the streets and soar across the skyline of the entirety of Gotham City.